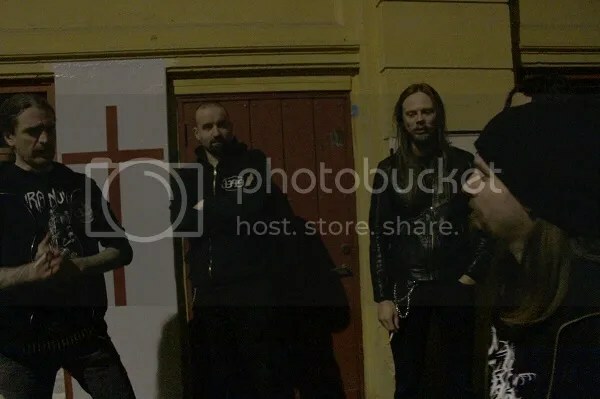 Twenty five years after having been formed by iconic drummer Jontho, veteran Norwegian Black Metallers RAGNAROK have entered the studio to begin work on what will be the band’s ninth full-length album. The, as yet unnamed, album is expected to be released during late May 2019 on Agonia Records. Why change something that works? We know the studio so well by now and how good the facilities are, and, after three albums, Devo really understands what RAGNAROK wants and how we work. He’s a great producer and we’re really looking forward to seeing what he does the new material. RAGNAROK will head for Canada later this month to appear at the Messe des Morts Festival in Montreal, and have been confirmed to appear at next year’s legendary Inferno Metal Festival in Oslo, Norway on the 19th April. Additionally, RAGNAROK will appear at Mörkaste Småland, Hultsferd, Sweden, on the 24th September. Formed in 1994 RAGNAROK’s history spans well over two decades. As with any band that has lasted this long, there have been changes in the lineup along the way, not least of which was the decision by Jontho, one of the most recognisable and respected drummers on the Norwegian Black Metal scene, to expand his performing repertoire by laying down his drumsticks and taking over as vocalist. Aside from Jontho on vocals, the band’s lineup includes long-standing guitarist Bolverk (IMAGES AT TWILIGHT), drummer Daniel Minge (DAUDEN) and session bassist Viti (IMAGES AT TWILIGHT, HINSIDIG). Norway’s RAGNAROK have signed a new three album deal with Agonia Records, continuing the relationship that has so far seen the release of the Norwegian Black Metal veterans’ seventh and eighth full-length albums, “Malediction” in 2012 and “Psychopathology” in 2016 respectively, as well as the special edition retrospective “Chaos and Insanity Between 1994-2004“, which traces the first decade of the band’s history. “We looked at several other offers when our contract with Agonia expired, but one of the most important things for us was the kind of relationship we could have with a label. We know that with Agonia we can have open and honest discussions and exchanges of ideas, which always result in something productive for both parties. It’s not just about releases for them, it’s also about all the other the other things that go into making a band successful”. “Psychopathology” was recorded at the Endarker Studio in Sweden with MARDUK bassist Devo at the helm. Following last year’s surprise announcement that RAGNAROK founder and drummer Jontho would be stepping out from behind the drum kit to take on the role of frontman and DAUDEN’s Malignant would take his place on drums, the lineup on the album comprises Jontho on vocals, Bolverk on guitars, Malignant on drums, and, making his swansong appearance with the band, DezeptiCunt on bass. With artwork by the Brazilian graphic artist Marcelo Vasco (Slayer, Machine Head, Dimmu Borgir), “Psychopathology” will be available in Jewel Case CD and Limited Edition black vinyl formats as well as in transparent brown vinyl with red, yellow, white and blue splatter, strictly limited to 133 hand-numbered copies. Additionally, Agonia will release a CD BOX which will be limited to 666 copies and which will include “Psychopathology” in CD format, a logo pin, poster, booklet with rare photos and old interviews, and the bonus compilation CD “Chaos and Insanity Between 1994-2004” (details of which can be found below ). As mentioned above, in addition to “Psychopathology”, RAGNAROK will also release a special compilation album titled “Chaos and Insanity Between 1994-2004”, which features a rare collection of the band’s early demos and EPs. The compilation will be released on Agonia Records at the same time as “Psychopathology” and will also be available in Limited Edition black Vinyl, as well as in a red vinyl version which will be limited to 133 hand numbered copies. Jontho recently had this to say about fans can expect from “Psychopathology”: ” I can say with absolute certainty that this album will be the best in RAGNAROK’s career to date. It is the result of dedication, hard work, and the musical skills of our lineup, and is the next stage in the band’s development, both musically and lyrically. “Psychopathology” is about to unleash total chaos upon you as it invites you to dive deeper into the dark recesses of the human mind”. 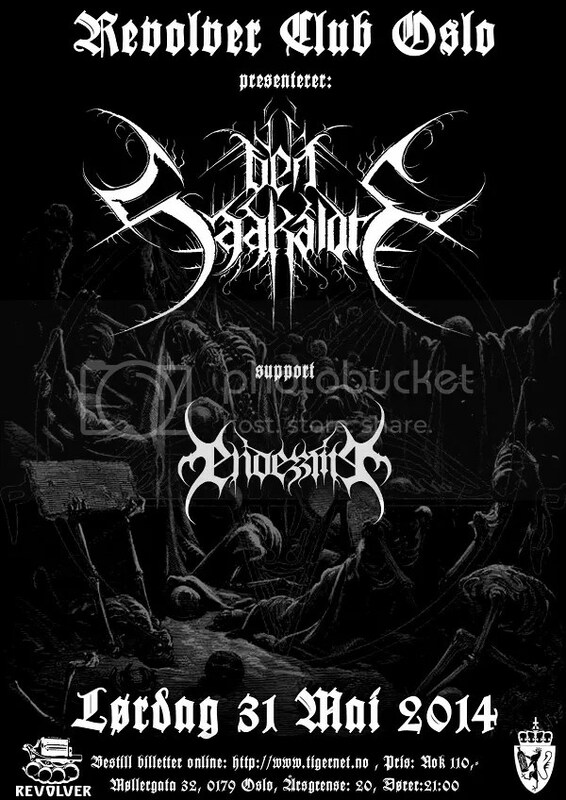 Norwegian Black Metallers DEN SAAKALDTE entered the studio on the 17th February to begin recording their new album. Titled “Kapittel II: Faen i Helvete”, it will be the band’s sophomore full-length album and a follow up to their 2009 debut “All Hail Pessimism”. Commenting on what the fans can expect from the new album, the band said that the material was “diverse, sick, (c)old and grim”. “Kapittel II: Faen i Helvete” will be released on Agonia Records later this year. 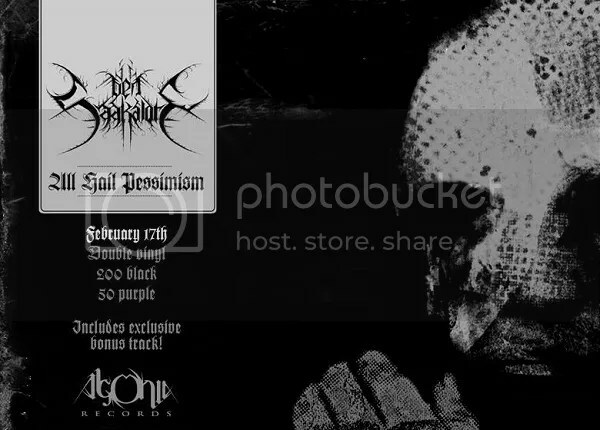 Also in February, a double LP gatefold edition of “All Hail Pessimism” is set to appear on Agonia Records in a limited edition of 250 copies. The first 50 copies will be pressed in deep purple vinyl, with the remaining 200 copies in black. 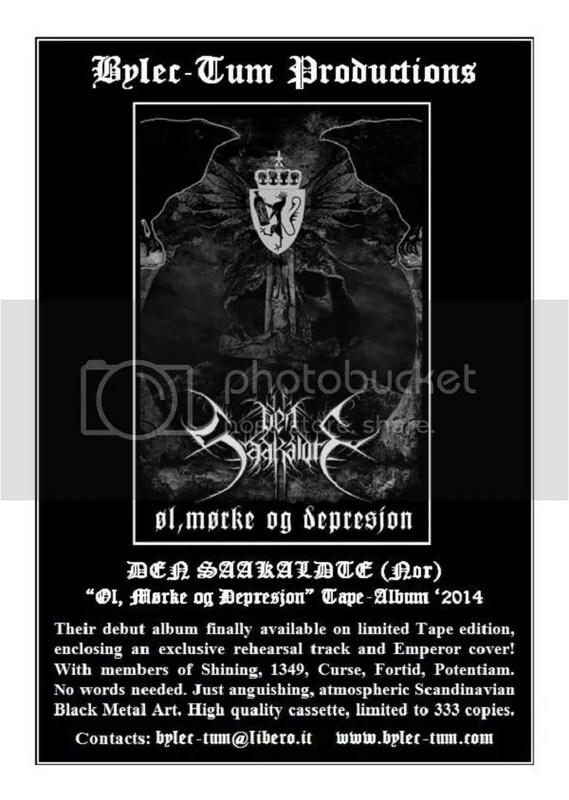 The band also recently went “Old School” with two of DEN SAAKALDTE’s previous releases appearing on pro-tapes. 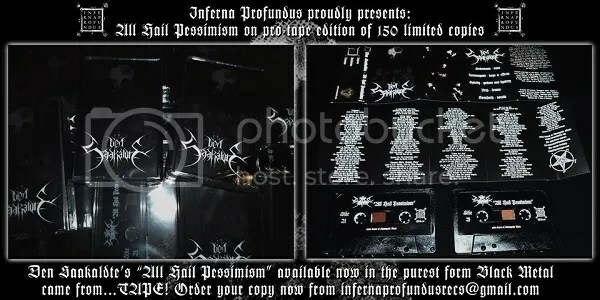 The 2008 demo “Øl, Mørke og Depresjon” was released in a limited edition of 333 copies on the Italian label Bylec-Tum Productions and the “All Hail Pessimism” album was released on the Inferna Profundus label in a limited quantity of 150. Formed originally as a one man project in 2006 by guitarist Sykelig, DEN SAAKALDTE recently announce the addition of frontman Einar “Eldur” Thorberg (FORTID, MIDNATTSVREDE, CURSE, ex-THULE) to the lineup. Aside from Sykelig on guitars and Eldur on vocals, the lineup also includes Andre Kvebek (PANTHEON I, ex 1349) on guitars, Seidemann (1349, ex-PANTHEON I) on bass, and Tybald (FORTID, ETHEREAL FOREST, HEATHEN DEITY) on drums.